To help them understand the post-operative knee structure, I like to show them a picture of a knee replacement X-Ray after surgery. That said, here is an x-ray of a patient who had successful knee replacement surgery. I thought you might like to see it as well. As you can see, the structure of the knee is restored to provide a smooth, flexible joint. Another way to consider the positive impact of a successful knee replacement surgery is to consider a before-and-after drawing. 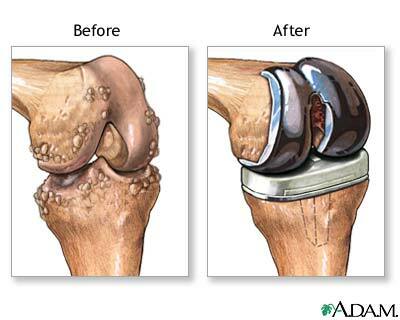 Here is a good illustration of the knee structure after knee replacement surgery. I hope that helps you better understand the structural enhancements of a good knee replacement surgery. This entry was posted on Monday, October 25th, 2010 at 4:23 pm	and is filed under Knee Replacement Surgery. You can follow any responses to this entry through the RSS 2.0 feed. You can leave a response, or trackback from your own site. Print This Post | Email This Post .